BOOMERANG Orientaventura is a circuit raid celebrated throughout Spain and which is practiced guidance and multisport. It is designed so that everyone can participate, without great technical skills or great physical preparation. The test is conducted in the natural environment of the park Fuentes del Narcea, Degaña and Ibias, englobándose in 4 steps to be performed during 2 days (Saturday and Sunday this weekend, 2 Y 3 of April). Teams must be formed by two people plus a reserve, and must take a tour with map and compass in which checkpoints and pass several tests of physical and technical skills include. an adventure in nature. Registration is now open to participate in its web. From the rural apartments El Balcon de Muniellos we encourage that you may apuntéis, and so you may enjoy nature of the region. from 8,30 so far output, delivery of documents and payment of registration fee in the municipality of Degaña. For teams “Learn and Participate” It will be given a mini clinic orientation once given the output. In addition they can also assist teams who want, it is not essential to have targeted “Learn and Participate” to attend this training clinic. We recommend you download the Regulation, because in the end is a guidance manual. At the beginning of this phase you must deliver the answer sheet “Knowledge of the environment” that we will give you at the time of data collection on Friday or Saturday. Of 22:00 a 23:00. All points of this phase are optional night, In total there will 14 controls and if everyone will do 6.600 m. There will also be a special test shooting blowgun. It must be half an hour before departure of each phase to effect control and collect signatures map. You should be aware of the signs that may occur by the PA in the starting area. In all there are technical special tests of the organization. From the rural apartments El Balcon de Muniellos, os recomendamos que este sábado día 2 of April, participéis en la primera entamada de gaiteros que se celebrará por las calles de la villa de cangas. Se harán dos recorridos. El primero comenzará a las 12 de la mañana, y el segundo a partir de las 18 hours, recorriendo el centro de la localidad y haciendo parada en todos los bares. 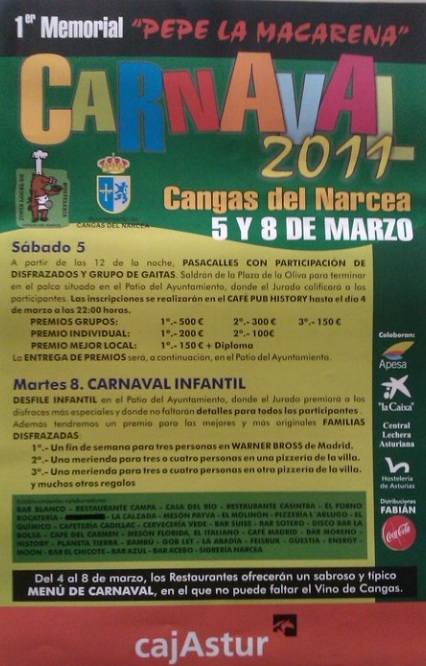 From Rural Apartments El Balcon de Muniellos, os invitamos a que os acerquéis a disfrutar de los Carnavales de Cangas del Narcea este próximo fin de semana. 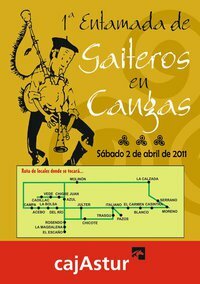 Los restaurantes de la zona van a preparar su Menú de Carnaval acompañado con nuestro Quality wine Cangas, además si venís disfrazados podéis participar en el Concurso de Disfraces y optar a premios desde 150 € hasta 500€.